Have it all at Northgate Village where you can enjoy contemporary living in a countryside setting. Our community is close to everything, so you can enjoy a serene atmosphere without sacrificing a great location. Burlington, New Jersey is the backdrop of our ideally located apartments and provides you with great shopping, dining, entertainment, award-winning local schools, and so much more. Just steps from home, Liberty Square Center is your destination for the best retail in Burlington. Take advantage of other nearby stores including Walmart, ShopRite of Burlington, and the Burlington Center Mall. Our proximity to major highways like Interstate 295 gives you easy access to a variety of major employers including a brand new Amazon Distribution Center. Schools, parks, and recreational facilities offer a variety of activities for every lifestyle. Experience the latest in apartment living in a location you will love. 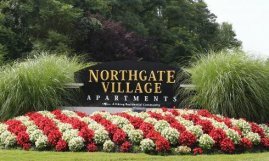 Northgate Village provides you with a unique selection of resident amenities that make your life a little easier. Make the most of convenient living with on-site maintenance and laundry facilities, online payments, and a resident basketball court and park area. Our pet-free community also means you don't have to worry about allergies. Enjoy comfortable living with all the accommodations you need to feel at home. Take time to check out our photo gallery for a first look at some of the great things Northgate Village has to offer. Our spacious one- and two-bedroom homes make it easy to find the space that's just right for you. Each apartment has been built on a foundation of convenient living with features like air conditioning and cable/satellite connections. Plush carpeting, modern appliances, and perfectly designed layouts provide you with everything you are looking for in your new home. Apply online now or schedule your guided community tour today!